Everyone knows I'm a Disney pin collector, but nobody knows that my mom and I are cork hoarders. Yes, wine corks, champagne corks - cheap or expensive - we save them. For years I have been tossing my wine corks into a box because I watched my mom do the same thing. I think we were both trying to figure out how to recycle them or get creative with them, but nothing ever happened. Last Mother's Day my beloved NoTwitterTodd got really creative - or really sick of seeing corks in the closet - and decided make a custom gift for me. 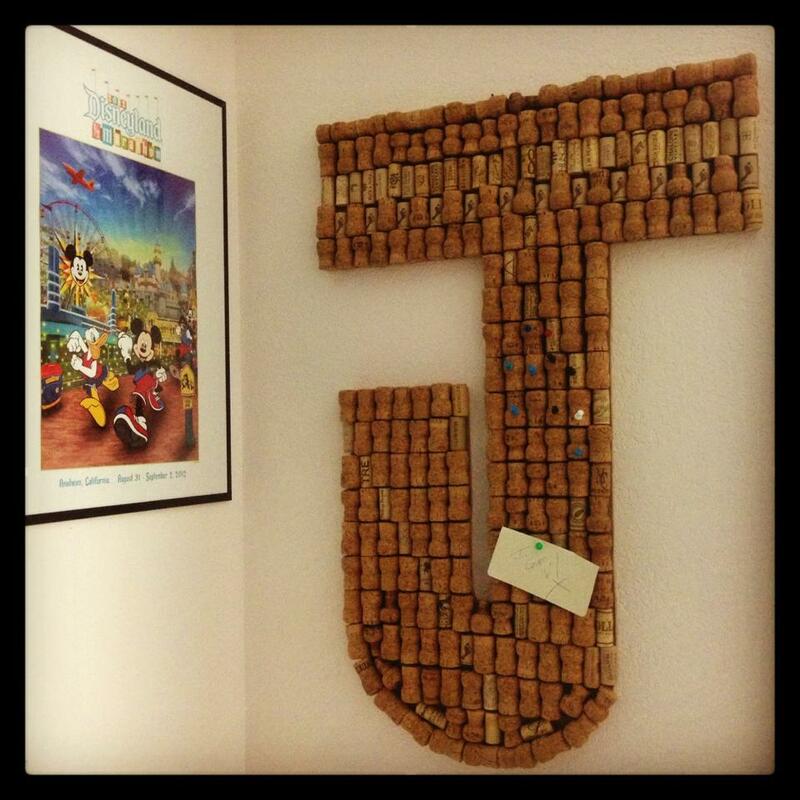 What he created was a jaw-dropping surprise: a stunning cork board, made entirely out my mom's corks and some of mine, in the shape of a "J". Standing an impressive 3 feet tall and 2 feet wide, with corks arranged in a deliberate pattern, I could not get over how much time and effort this took to make. How did he do it? 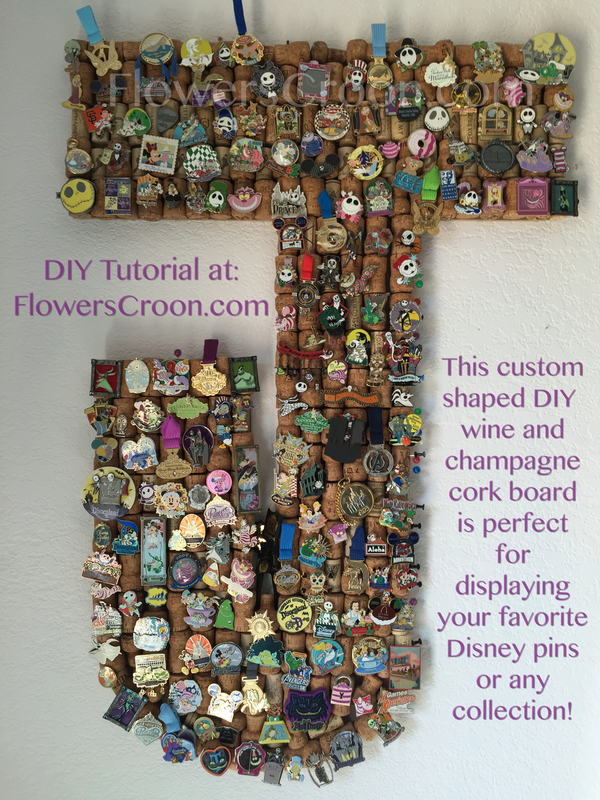 Determine pattern for wine corks by laying them out on the board without gluing them down. Some corks you may have to shave a bit depending on your board size. Luckily, he found a way to make these all fit without cutting them. Patience is key here. Glue down corks. Set aside to dry. After all corks are dry, give the board a jiggle or shake to ensure none are loose. Touch-up with glue as needed. Turn board over, cork side down, and mount evenly spaced picture hangers to the back to ensure your board hangs straight and securely. I first used my board to display family photos and pin upcoming concert and game tickets somewhere where I could see them and not lose them. Pretty soon I realized this was awesome real estate for my extensive Disney pin collection. This particular board has pins I'm not interested in selling or trading. I have lots of artist proof and pre-production pins, lots of Nightmare Before Christmas pins (from when the overlay to the Haunted Mansion was introduced at Disneyland) and a variety of other fun pins that are hard to find or retired - such as the old Annual Passholder Disney Dining pins. I outlined the edges of the "J" with pins that glow in the dark so that it looks just as awesome at nighttime as it does during the day. What I love most about this board is that he made it for me. I always tell him and my daughter that I don't want them spending money on me for Christmas or Mother's Day, etc. I just want time with them. So when he takes the time to make me these incredibly unique and thoughtful gifts, I am humbled by his love and thankful to have him in my life. I have lots more pins, and loads of corks - so I am hoping to make more boards soon.